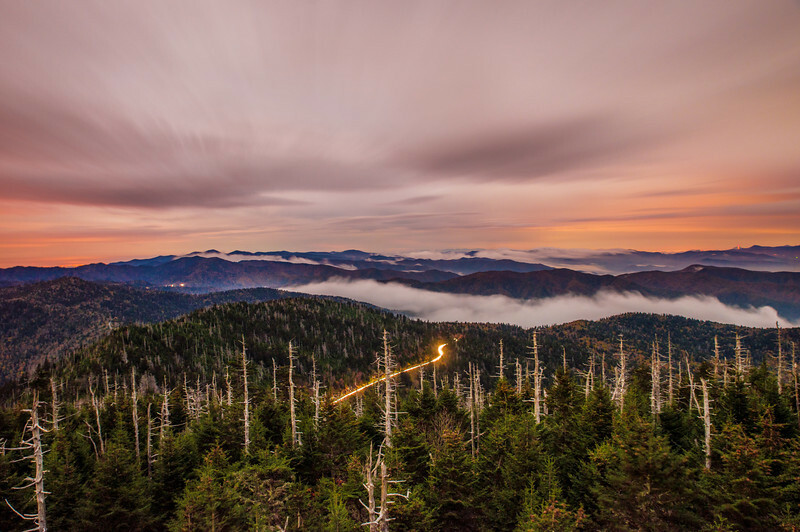 Straddling the state line between Tennessee and North Carolina and rising 6,643 feet, Clingmans Dome is Great Smoky Mountains National Park’s highest point. It is also the highest point in Tennessee, and the third highest point east of the Mississippi. Only North Carolina’s Mt. Mitchell and Mt. Craig are taller, and they each have less than 100 feet on Clingmans Dome (counting the observation tower, Clingmans Dome might actually be taller than both). The observation tower on the summit of Clingmans Dome is about a half-mile hike from the Clingmans Dome parking lot, and it’s a sight in itself, offering 360° views of the Smokies and beyond. On clear days you can see 100 miles from Clingmans Dome, into 7 nearby states. Unfortunately, air pollution often limits viewing distances to under 20 miles. Clouds also can limit the view–when I first arrived up at Clingmans Dome for some night photography, rolling clouds sometimes cut visibility down to around 20 feet! Temperatures at the dome can be around 20 degrees colder than in the surrounding lowlands. I witnessed this firsthand, and found it was freezing and incredibly windy (so windy that even weighed down with my camera bag, my tripod moved during some exposures) up there, with the weather actually nice one I drove down to a lower elevation! Due to the cool and wet conditions on Clingmans Dome’s summit, the surrounding spruce-fir forest that grows there is actually a coniferous rainforest. Unfortunately, pests and pollution threaten this rainforest, causing the dead and dying trees you see in the foreground of this photo. I had a second exposure of this photo without the streaking lights of traffic cutting through the frame, but I ultimately decided to use this shot because I think the traffic and the dead trees helps drive home the point that humans often play a destructive role in these fragile ecosystems. So often nature photos seek to showcase only the serene beauty of a scene, when many of those scenes actually are not so perfect. Much like portrait photographers work to control their environments, so too do landscape photographers, just in different ways. I could have easily zoomed past the dead trees in the foreground to create a “perfect” scene (and I did for alternate, unused shots), but I ultimately decided to use this scene to show what’s really there, warts and all. While you’re certainly welcome to continue checking regularly for new updates, this will be the last post here for a couple of weeks. I was hoping to have some posts scheduled to post in my absence, but I didn’t have enough time. The good news is that we should have a lot of great new content after Thanksgiving! In the words of SNL Nic Cage, for now it is time for me to ride off to my NEXT adventure! Photographed with a Nikon D600 and the Tamron 24-70mm f/2.8 Lens. In terms of editing, I warmed the white balance a bit to reduce some of the heavy blues on the mountains, increased the fill light to bring out some detail in the mountains, increased the vibrance, and then opened it into Photoshop CS6. There, I did adjustment layers for curves and color balance, making sure the trees were an accurate shade of green. I find that this color balance curves adjustment is better for fine tuning colors than Adobe Camera Raw. What do you think of the dead trees and traffic in the foreground? Should landscape photos capture that perfect scene, even if that’s not the “full” reality of a scene, or is there beauty in a ‘warts and all’ photo? Hearing from you is half the fun, so please share your thoughts in the comments! Review: Is Chi Lin Nunnery Worth Visiting? Hey Tom! I’m looking to get a new lens for my Nikon D7200 to replace my Nikkor 18-140mm kit lens. I already have the Sigma 18-35mm and a 35mm 1.8 but I need something with a bit more reach. I was originally going to get the Tamron 16-300mm because it seems like it would be a good choice from an all-around perspective (I know it won’t be as good as the Sigma) but then I was second-guessing myself and thinking maybe I should do the Tamron 24-70mm just in case I make the jump to full-frame… Thoughts?? I really like the dead trees in the picture, but for the message and the contrast to the picture. The traffic I thought was maybe the sunlight reflecting off a stream in the distance – I guess not. We didn’t get to Clingman’s Dome, but we did the hike up Mount Le Conte. 8 miles of hiking to be greeted by the smoky/hazy/pollutiony view of maybe 20 miles. I’m glad you had better skies! Yikes. Not a very good reward for all that hiking!